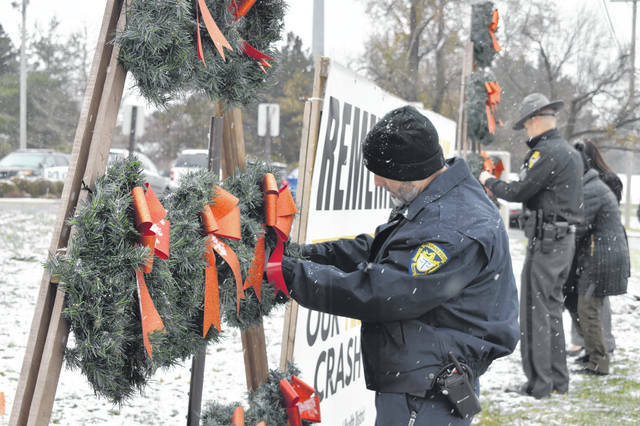 City of Delaware Police Officer Robert Hatcher places a name on a wreath Thursday morning. Four new wreaths were added to the display this year to honor Buckeye Valley students Jacob Richardson, 16, and Mykaela Fellure, 15, who were killed in a crash on Jan. 24; Thaddeus Laurol, 17, a Franklin County teen who was killed on Feb. 9, and Cody Segner, 17, a Big Walnut teen who was killed on Sept. 28. Thursday morning, law enforcement, community members, and the SAFE Delaware Coalition gathered at the Delaware Post of the Ohio State Highway Patrol on U.S. Route 23 to add four wreaths to the annual display signifying the number of young people killed in the county in traffic accidents over the past 10 years. 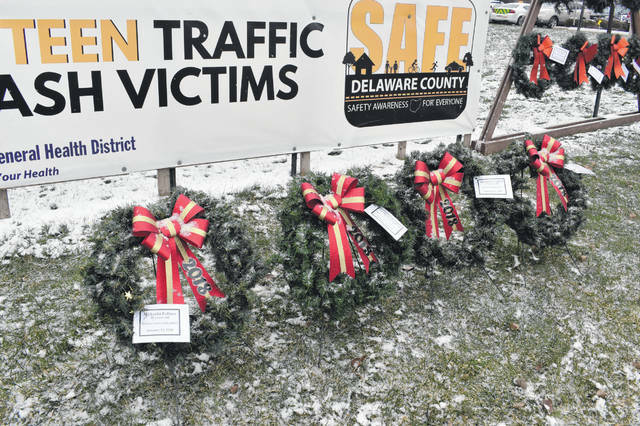 SAFE Delaware County Coalition Coordinator Jackie Bain spoke at the event, which she said began in 2012 as a way to honor the young victims of fatal crashes and raise awareness around the holidays. During the event, family members and community members pinned the names of each young person to a corresponding wreath. Bain said 20 young people have been killed in fatal crashes in the county over the past 10 years, and the ceremony provided the opportunity to remember four more juveniles who were killed in crashes this year: Buckeye Valley students Jacob Richardson, 16, and Mykaela Fellure, 15, who were killed in a crash on Jan. 24; Thaddeus Laurol, 17, a Franklin County teen who was killed on Feb. 9, and Cody Segner, 17, a Big Walnut teen who was killed on Sept. 28. Bain added that the superintendent of all the Delaware County School districts have signed on to promote driver safety awareness using an upcoming web portal for students.